From finishes that are guaranteed to last a lifetime, to faucets that perfectly balance your water pressure, Moen sets the standard for exceptional beauty and reliable, innovative design. This brushed nickel one-function 8 in. 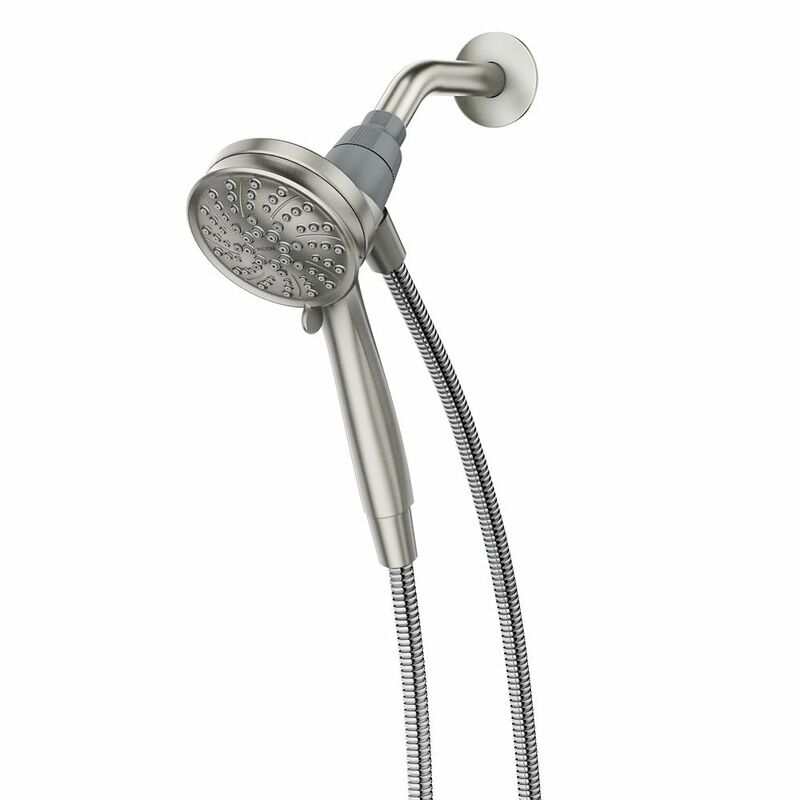 diameter rainshower showerhead was built to last by Moen. Designed for use in your bath. Inspired by patterns found in nature, it offers a distinctive design which is at home in any transitional dicor. Gracious and uncomplicated style features give the Engage collection an ageless yet fashion-forward presence. Tailored yet relaxed, the Engage collection is an exercise in design balance. This lustrous collection works seamlessly with today's lifestyles. Attract 6 Function 4-Inch Handheld Shower with Magnetix in Spot Resist Brushed Nickel is rated 4.6 out of 5 by 105. Rated 5 out of 5 by Ron from Works well with no leaks. The magnet is easy... Works well with no leaks. The magnet is easy to use. Rated 5 out of 5 by LAS from I looked all over for a detachable shower head that... I looked all over for a detachable shower head that still had good pressure when attached. After returning a few others, this one finally fit the bill. As a regular showerhead it has great pressure and is just the right height and the magnet makes it really easy to reattach. Love it. Rated 5 out of 5 by Chester from So easy to install. The magnet is very strong, and finds it's way on to the shower nozzle very ea... So easy to install. The magnet is very strong, and finds it's way on to the shower nozzle very easily. Love the variety of spray options. I especially like being able to use it as a mounted nozzle and also as a hand held spray. Great for washing down the shower after cleaning the walls. Rated 3 out of 5 by 818Plumber from Make sure you use Teflon tape or it leaks.... Make sure you use Teflon tape or it leaks.